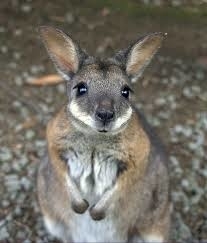 The wallaby resembles marsupials similar to the small kangaroo. Wallaby can be seen in many French and European zoologica l parks. Wallaby adapt very well to European climates. It re produces relatively well. There was a colony in south of the rambouillet forest. On average, females weigh 8 to 15 kg, males 15 to 22 kg.